Here’s another holiday scarf you can adapt for any yarn craft: crochet, knit, loom knit or, as I did, the Addi Professional! So how cute is this?! I made the carrot nose button from polymer clay but ready-made buttons are available. I’ve only seen them online but I’m sure some crafty retailer has them in stock in their stores! Use these basic measurements as a guide. Click to enlarge the picture. 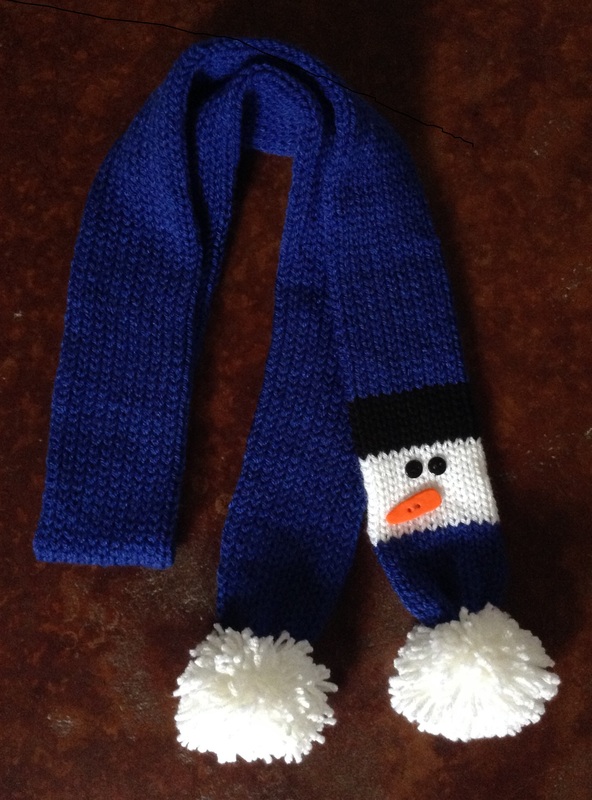 ATTENTION LOOM KNITTERS: A member of Loomaholics (group on Google+) found this loom knit, double face snowman scarf you might like! can you do 140 rows on this scarf on the loom instead of 240 rows?because it makes it to long on the loom. thats how Iam doing the next santa scarf.thank for your help. I have no idea how many loom knitting rows it is but I gave you the measurements of each color for you to use as a guide. Keep your tape measure handy as you work and stop when you’re happy with the length. alright thanks anyways for the informantion. Hi margatet I thought you could make a Halloween scarf to with the same idea. Love your videos, I see something new every time. I ment to say you can make a pumpkin scarf. hi i used the clover pom pom makers how do you have your pom poms not pull apart???? afraid it will fall apart in the wash also how long is the carrot thank you so much! Hmmm… My poms don’t just pull apart. I suppose they would if I really worked at it! Just make sure you’re pulling/knotting very tightly before you remove it from the pom pom maker. Clover Needlecraft made this demonstration video that you may find helpful. I’ve never washed a pom so i’m not sure about that! I made the polymer clay carrots about 1.25″ long. You have to really search for that center pull but it’s there… at least that’s been my experience. I usually don’t wind brand new skeins. I wait until some has been used and the rest is all floppy in the wrapper! thank you so much i saw the nutcracker on youtube it wouldnt let me comment so going to comment here LOVE IT!!!! please tell me you are going to do a tutorial and what colors red heart you used THANK YOU THANK YOU THANK YOU!!! hello margaret well i wanted to tell you that iam done with my scarf and its is really cool. thank for sharing it with others.I hope you show more. Great, Randee! I’m working on a nutcracker at the moment. That’s crazy, Missy! I’m so glad you saw this post!! I chose a forest green color (not sure of the brands at the moment) for the main part, navy blue for his hat, that peach color I used on Santa for his face, a red coat, gray drum and navy pants and there will be gold fringe on each end to be reminiscent of epaulettes a real soldier would have on his shoulders… but look at some pictures of nutcrackers to choose your colors! But then again… wait until you see him ’cause he may not be as exciting as you’re hoping! I cant wait! I need all the help i can get! I love the brands and colors you choose. thank you so much! I have never enjoyed the Addi more since I found you on youtube! Doing hats for our city mission too. I saw your new scarf on youtube when are you going to show how to do it for us that loom knit? by the way my aunt lucy loves your snake scarf. Thanks for your help. Don’t have any plans for that, sweet Randee! I design them, measure all the pieces and parts for others to use a guide, make videos and post notes on the blog… it’s up to the individual crafter to take it from there! Besides, you know more about looming those scarves than I do! 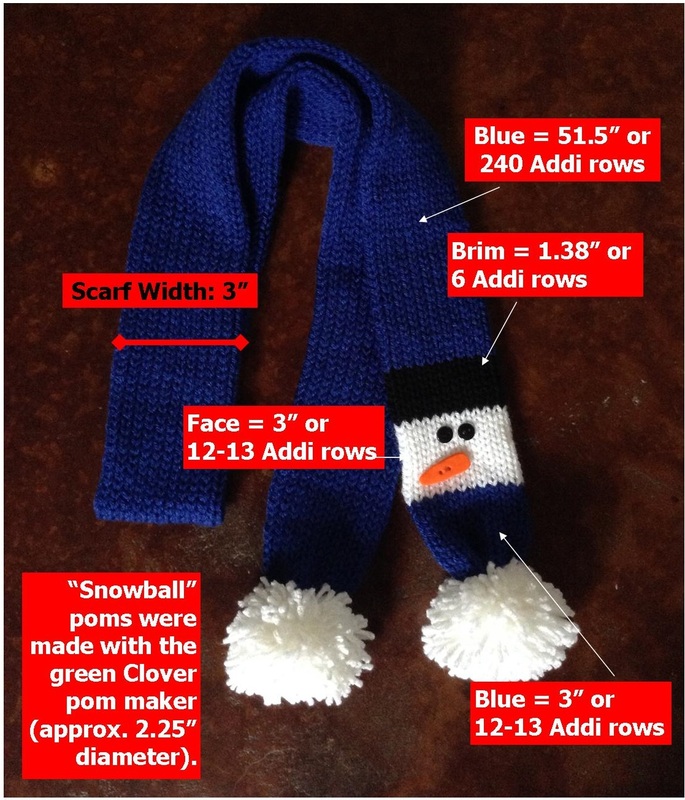 I’ll get the video and notes for the Nutcracker up soon and you can use your Santa and Snowman to help you figure out how many rows of each color to do. I just started watching you , I think you are wonderful. You are so creative, you inspire me. THANK YOU. You don’t need detailed crochet instructions! Just choose your stitch and refer to the measurements I provide! Easy peasey! For example: these are 3″ wide tube scarves so chain about 6-7 inches; join and continue making a tube (I’d use single or half-double crochet. Change colors when your measurements indicate. Stop when it’s the length you want. Add the embellishments just as indicated for the knitted version. Done! hi how do you sew your buttons on do you just sew them on and have stitches showing on the back of the knitting? thank you!!!! No stitches should show on the back of the knitting! Just put the needle through the top layer. I just tip the button up and look under it as I go and since knitting is rather stretchy and flexible it’s easy to do. Sometimes it helps if you pinch/fold that top layer right under the button after you get started. Someone else waits to close the bottom so she can stick her hand into the scarf but I find that much more awkward. Of course, you could always use a jewel glue instead!